Coming Soon: Edge of Tomorrow – We have the Chopper ! Released on May 30th, Tom Cruise and Emily Blunt take the lead roles in this year’s latest sci-fi blockbuster Edge of Tomorrow, an epic revamping of the Japanese light novel ‘All You Need Is Kill’. In the film, Tom Cruise’s character Major William Cage finds himself in an endless time loop between death and fighting off Earth’s alien invaders – each new life enables him to ascend his fighter skills during his battles. A film with such a huge budget means that aside from the epic on-screen action and special effects, there will be hundreds of props used to enhance the atmosphere, offer realism and other important cinematic traits. Some of the props then become available once filming and production finishes – and we grabbed the very best of the bunch! 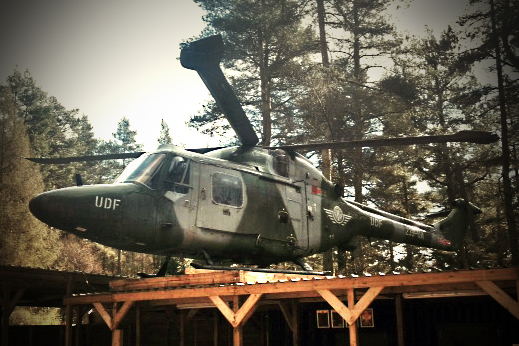 UDF helicopter at the Delta Force Paintball centre in Surrey and explore the inner workings of this awesome machine, as we have left most of the interior untouched for extra authenticity – yet unfortunately we had to remove the ejector button! 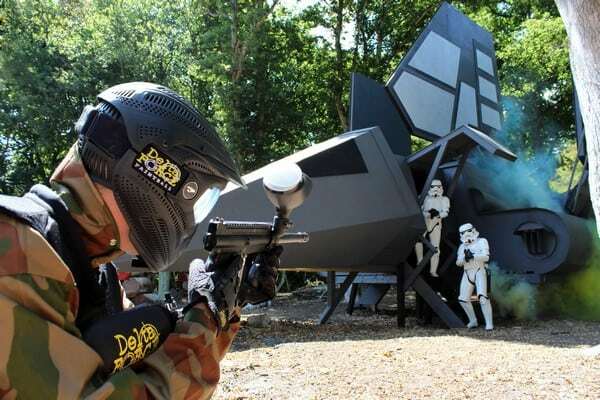 Surrey Paintball Centre has seen over £40,000 alone spent on designing, developing and constructing these awesome game zones and props. Come along and see it in the flesh, there is no other way to experience it!